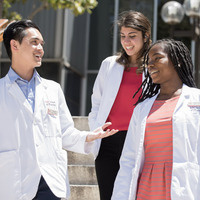 Many PharmD students at the USC School of Pharmacy say that coming to campus for an Information Session is what clinched their decision to enroll in the program. At an Information Session, you will tour the USC Health Sciences campus and pharmacy facilities, led by a current student. You also will have other opportunities to interact with students and faculty members, see first-hand the camaraderie prevalent at the School and learn everything you need to know about the program to see if it's the right fit for you. To reserve your place at an Information Session, please call the Office of Admission and Student Affairs at (323) 442-1466, or fill out this interest form. Parking is available in a parking structure at Biggy Street and Zonal Avenue for $12/day. Four-hour metered parking is available along Biggy Street. Click here for a map and directions.